Norwegian mass killer Anders Behring Breivik is due to serve his 21-year sentence in Ila prison near the capital, Oslo. Breivik, 33, has already been kept at Ila for more than a year under its Regime of Particularly High Security, which is the country's strictest regime for prisoners. The prison said in a statement before Friday's verdict that Breivik would initially be kept isolated from casual contact with other prisoners. Instead, his face-to-face contact with other people would be restricted to prison staff, and the hour each week when he is allowed to have visitors. Ila is an all-male institution which "houses some of the country's most dangerous men", its website says. Former inmates include Varg "Greven" Vikernes, a notorious black metal musician who murdered a bandmate and burnt down historic churches in the early 1990s, for which he served 16 years. However, the prison that holds Breivik differs markedly from other maximum security jails in Western Europe: the staff is a half-and-half mix of men and women, and none of them are armed. 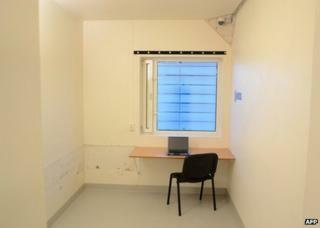 Photos have been released of the facilities available to Breivik. He currently has three cells, in "compensation" for being denied access to activities available to other inmates, prison spokeswoman Ellen Bjercke explained. Each cell measures 8 sq m (86 sq ft). One is a bedroom, one contains fitness equipment and the third is a study with a laptop fixed to a desk. The computer is not connected to the internet, in order to prevent communication with the outside world. He is unlikely ever to have free access to the internet, Ms Bjercke told the BBC News website. Even if he eventually qualifies for educational activities, he will only be allowed to use a special server run by the prison "with a lot of filters", she explained. Breivik's defence lawyers have said he is planning to follow up the manifesto he published online before his attacks by writing books. As a prisoner, he has the right to write as many letters to the outside world as he likes. "But we go through everything and if we find anything in breach of the law, which encourages criminal activity for instance, then of course we can stop it," the prison spokeswoman said. For fresh air, Breivik has access to a reserved outside area enclosed by tall concrete walls and barbed wire. For entertainment, he has a TV set and can order books from the prison library, which is part of the public library network. In theory, he can have any books he wants unless there are security concerns - "not bomb-making manuals", as Ms Bjercke put it. Asked whether Breivik, who used to relax by playing video shooting and role-playing games, would have access to computer games, she said it was a police decision but she doubted he would. In its statement, the prison explained that, under the Regime of Particularly High Security, a prisoner is not allowed to meet inmates from other wings. However, he may meet other inmates in his own wing if it is deemed safe. "The Regime of Particularly High Security puts a heavy strain on an inmate, especially if it lasts for a longer period," the prison noted. Therefore, prisoners like Breivik are given greater contact with prison officers and more opportunities for work, education and other activities. "The idea is to increase contacts with the prison staff who are tasked with keeping him active, doing physical exercise with him, talking to him," Ms Bjercke told the Associated Press news agency. "Isolation is torture." Officials at Ila were quoted by AP as saying the ambition was eventually to transfer Breivik to a section with other prisoners. These have access to a school that teaches from primary grades through to university-level courses, a library, a gym and work in the prison's workshops - which produce such items as furniture and hats and gloves. "I like to put it this way: he's a human being," said Ms Bjercke. "He has human rights. This is about creating a humane prison regime." One change Breivik should notice after returning from court is a tightening of his daily regime, she told the BBC. While still on trial he was allowed to spend his time much as he wished but, as a convict, he will be wakened each morning at 0700. It will still be up to him, however, what time he goes to sleep as there is no "lights out" rule. Founded as a women's prison, Ila was used as a concentration camp during the Nazi occupation of Norway in the 1940s. The modern prison has 12 wings and can hold 124 prisoners, overseen by 230 staff who can monitor them via surveillance cameras. The last time a man escaped from Ila was in 2004, and he was caught within minutes, according to prison governor Knut Bjarkeid. While none of the prison officers are armed with guns, they do have access to batons and can use tear gas if required. "I've been in this business for 30 years and I have never seen gas being used," said Ms Bjercke. "We use it very, very seldom." If a situation arose where firearms might be necessary, the prison would call in the police, she added.